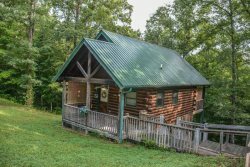 This log cabin is located 5 minutes from the twin cities of McCaysville, GA and Copperhill, TN. Approximately 20 minutes from Blue Ridge. The cabin is in a very private setting with no other cabins around it. Located 20 Minutes From Blue Ridge And Only 10 Minutes From White Water Rafting! This log cabin is located 5 minutes from the twin cities of McCaysville, GA and Copperhill, TN. Approximately 20 minutes from Blue Ridge. The cabin is in a very private setting with no other cabins around it. Come listen to our mountains from the large covered porch or enjoy a starlit night from the private hot tub. A romantic mountain getaway or a fun filled vacation awaits you at Sugar Maple. Walk into an open concept living, dining kitchen area with a beautiful wood burning fireplace and step out onto the large open air porch and enjoy nature. Cabin has a bedroom on the main floor with a queen size bed, flat screen TV and access to a full bath. Loft bedroom has a king bed, flat screen TV and a full bath. Lower level has a pool table, flat screen TV, game table, dart board, day bed with trundle and a full bath. The home also has central heat and air, WiFi, cable TV, washer/dryer and all the comforts of home. Only 10 minutes from whitewater rafting on the world famous Ocoee River site of the 1996 Olympic Rafting. This is the perfect spot for family fun and adventure! Nearby attractions include hiking the beautiful trails of North Georgia, biking, Antique Shopping, White Water Rafting, Horseback Riding, Scenic Train Rides and the famous Swan Drive In. Ive been staying with Mountain Laurel for about 5 years now, my husband and I loved it so much we decided to celebrate our honeymoon here! The people are wonderful and always willing to help. And with the view from the cabin, you cant beat this price!" This is a very nice cabin. There were 3 of us and we all got a bedroom and bath . The den was cozy . Its a great location to Blue Ridge . We loved it . We felt like the price was extremely good for all the amenities . The views were amazing. Reasonably priced and secluded. The staff was very helpful. You team was wonderful! Very knowledgeable and answered my questions very quickly that I sent via email. Booking the stay was very easy. The cabin was beautiful and very well decorated. Everything you could need or want is readily available. Only thing I would have preferred would have been to have tvs in the bedroom. Other than that the entire experience was wonderful. We spent a lot if time playing pool and relaxing in the hot tub. You can also hear the river in the background which was very relaxing. Horseshoe Bend park is not even a mile away which is awesome. The location is great! Getting there could have been difficult if not for the driving directions given by the staff. Make sure to follow those and not the GPS! My family thanks you for the wonderful time! Wonderful times with family. Enjoyed our stay!! All contact was professional & friendly. Perfect for our family reunion! Fully stocked, ready to walk-in and start living. Excellent place to stay. Clean, very comfortable, had everything we needed! Very professional and knowledgeable staff. Extremely friendly service. we arrived a little early and cleaning lady( miss bee)was still at property. she was very friendly, and the property inside was very clean. Awesome cabin with privacy and a beautiful forest view. We saw a large flock of turkeys that were on their way to roost. Love this cabin - very clean and the towels being folded were a nice touch. Felt like I was on a cruise! Your staff was very friendly! Went above and beyond,and I have worked in the hospitality industry. I never rented a cabin line this before and went I called with additional questions about checking in, the rep stated they already had the rental agreement and therefore sent me the check in steps. First thing before we left Panama City, I received the check in code for the door. I had asked about possible early check in and was told to just call when we got about an hour away and if the property was ready we could have checked in early, but we took our time getting up there and actually didn't need the option, but it was nice to have the option should we have needed it. The stay was AMAZING! The freshness took out breath away when we walked in for the first time! love the set up as well. We had 5 adults in our party and not once did we feel like we were on top of each other. We will be coming back next year and hopefully, renting the same cabin! Everything we expected it to be. Very clean upon arrival. Would definitely consider booking with y'all again. Very clean and spacious! Great for family fun!